In its country of origin, One Piece is an unstoppable juggernaut. Here in the states, however, the case isn’t quite the same. Fortunately for us, that doesn’t exclude from getting fun diversions like Pirate Warriors 3 this side of the Pacific. Of all the anime that could adapted to fit the Dynasty Warriors formula, One Piece is among the best. Luffy and his band of Strawhat Pirates get into massive melees regularly in Eiichiro Oda’s magnum opus. In that sense, seeing them bowl over waves of nameless pirates is no stranger than seeing Goku tell someone he’s going to power up for the 1897394873297489th time. Still, there’s something about being able to cut through massive waves of enemies that’s just satisfying, and the Warriors series has refined it to an art. Hopping above a large group of gawking goons and raining blows down on them, only to have a flashy final attack that wipes out even more foes is deeply satisfying and something I can’t get enough of. Each of Pirate Warriors 3’s characters plays in a unique and interesting way, and there’s a ton of ‘em. Cycling through the roster is a great way to keep the game fresh, and the characters themselves are mostly enjoyable. Pirate Warriors 3 feels like it took some very good lessons from Koei Tecmo’s most famous Warriors game, Hyrule Warriors. Pirate Warriors 3 controls every bit as well as its Zelda-themed cousin. The game is fluid and runs beautifully, even if the game itself is not as pretty as the Wii U juggernaut. If you haven’t read or watched One Piece, catching up can feel incredibly daunting. With the manga closing in on its 800th chapter, and the anime well into the hundreds of episodes, it’s hard to even think about picking it up now, unless you have plenty of time on your hands. Fortunately, Pirate Warriors 3 picks up at the start of the series and gets you pretty far in there without subjecting you to lengthy cutscenes. Sometimes it’s really nice to have a well-crafted story, but when you’re talking about something as massive as One Piece lore, the digest version works just as well. It takes what could otherwise be an intimidating experience and reduces it to something much more manageable. Fans of the series will come for the gameplay, and the shortened telling of the story may win over some new fans. New to Pirate Warriors 3 is a system called Kizuna Rush. Each character on the game’s sizable roster has at least one crewmate they can call on at the end of combos to help deliver the finishing blow. In addition, every character has a combo attack that uses up their kizuna gauge. The attacks themselves aren’t much to look at; enemies just kind of flop dead after your partners get their closeup, but they’re incredibly effective. Often time you’ll rack up into the hundreds of kills with one of them. The idea of having a comrade jump in to assist is, to the best of my recollection, new to the Warriors series and it works extremely well. The way the screen momentarily freezes and lets you watch your buddy come in to save the day doesn’t get old. It’s cool every time. Well, this is kind of a weird section to write. The review copy provided to me Bandai Namco didn’t quite look like the screenshots on the game’s Steam page. So far, there’s been no explanation as to why this is, though it appears the shots used are from the PS4 version of the game. Unfortunately, the PC version seems to be a port of the last-gen version of Pirate Warriors 3, which is a tad perplexing. Regardless, it at least looks passable. The last-gen environments are a bit sparse and lacking in detail when held up next to the PS4 version, but it’s not bad enough as to be distracting. Pirate Warriors 3 is still a passably pretty game, if not a head-turner. There’s nothing really revolutionary about the modes on offer in Pirate Warriors 3, but that’s not necessarily a bad thing; they’re good, they’re just what we’re all used to. There’s a standard campaign mode, a mode that allows you to replay the campaign with any characters you see fit, and a “dream mode” that’s used to take place in battles outside of the One Piece canon. In dream mode you can unlock new characters, and then of course use them in the other modes that allow for it. Pirate Warriors 3 also offers two-player split-screen co-op. It’s a standard set of modes, just nothing earth-shattering. There’s not much to say here. The game doesn’t recognize gamepads on PC. You can use them, but prompts to push buttons still reflect a keyboard setup. It’s off-putting and annoying, to say the least. 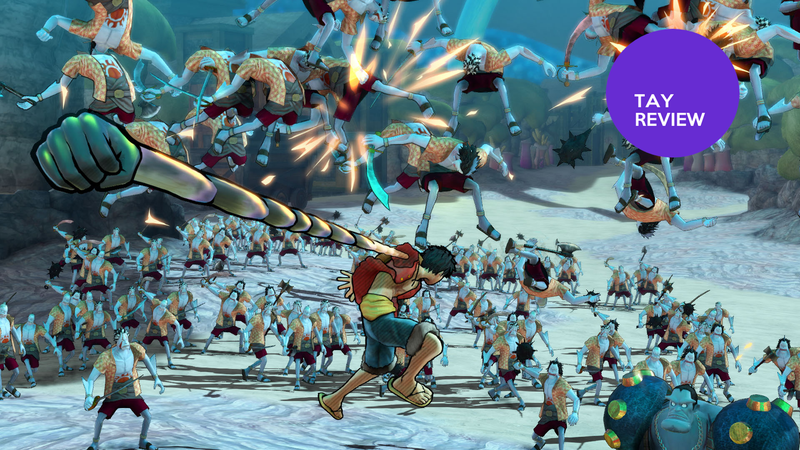 One Piece Pirate Warriors 3 is a respectable entry in the long-running Warriors franchise. It learns from its predecessors and invents a few new tricks of its own. It controls well and is a great primer for those unfamiliar with the series’ lore. Most importantly, playing it is just fun. Even if you don’t dig One Piece, odds are you can get some enjoyment out of this one.